"The most common problem with dating today is that a majority of people passively wait for love to fall into their lap. By doing absolutely nothing to increase your chances of getting dates, you actually decrease your chances. It’s a numbers game, folks!" 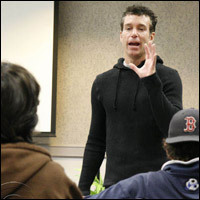 Based on David Wygant’s popular What’s Your Excuse?™ Social Dating Seminar, the college tour is uniquely designed to address common fears and excuses of college-age singles. This fun and entertaining group seminar is a cross between a dating workshop, talk show and a game show. The seminar takes the participants on a wild ride that’s evoked from a no-holds-barred discussion between the sexes…! For more information, please email david@davidwygant.com. I caught your seminar down here in San Diego a couple of weeks ago. I just wanted to say, “Good Job!”. I really didn’t think much about how I’ve opened in the past. I always felt that just going up and talking to somebody was just that, and opening a girl I liked was stressful. Lately I’ve been opening normal people like I have a little attraction to them and opening HB like I don’t really like them. this way over time I’m feeling that openings are balanced and normal. Actually if I approach a HB with no desire I don’t have a problem chatting them up. So when I heard what you had to say at the seminar I started thinking about how and when I open. Understanding that just approaching and starting a conversation is normal, not only with HB but people in general. down the street or stopped at street lights. We hit one bar and girls were walking by smiling at me. We bounced to another bar and ran into some Irish guys causing a bit of a ruckus. I chatted them up and we were all laughing and joking around. When HB and I left the bar arm in arm she asked me if I was the major of San Diego. I didn’t get it at first but then it clicked. she took me back to her hotel. anyway, Since you preach this I thought you would enjoy it. Feel free to use it as an example. I’d like to personally thank you for attending Rutgers University. Your presentation really helped me to get an insight on women. Even though I didn’t walk out of there with new friends or necessarily went out to meet new people, the program managed to open my eyes and seeing things differently. Because of this, I found out my friend Katie had a crush on me, and I have been going out with her for 2 weeks now, and things seem to be going really smoothly. Hey Dave. The girls situation is coming along slowly but surely. I have a lot of girls at WPU that wanna hang out with me, and I still think I’m making serious headway. I OWE YOU ONE BIG TIME FOR THIS! Everything you’ve taught me is very much appreciated, and I just wanted to thank you for that. 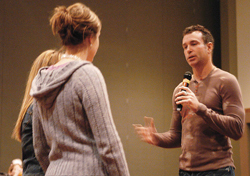 David was a genuine speaker who really cared about the self-confidence of the students. I appreciated that he stressed the importance of conversation, above all other factors, in meeting others. The students that were there were participating and asking lots of questions; they seemed to really enjoy the lecture. I usually don’t enjoy audience participation aspects of presentations, but David made everyone feel at ease. My name is Chrissie and I was a student that listened to you speak at Lambuth University. You did an awesome job, thanks for sharing your stories! So no one asked what you thought about the movie “Hitch” the portrays you and people that are in the match making business. So what were your thoughts on the movie? And if you don’t mind me asking, what experience made you so comfortable to be more open to help other people with their love lives? Have you ever crossed anyone that you just didn’t help because they were just awful or do you help everyone even if they have bad intentions? Well again, you were an awesome speaker! Have a Great Valentines Day by the way! Wow! I don’t know how or where to start to express the feeling I had after leaving your lecture last night. I got home, and I was just so inspired that I didn’t want to fall asleep. You are a breath of fresh air. I think it is pretty amazing what you do by going to the colleges and giving some enlightenment on dating. I listened to the questions and feelings that the kids expressed, and seeing how you give them encouragement to have self confidence. It was wonderful. And for me, the 30-something, that gets hit on by players, and the guys twice my age, left me feeling I wished I had a lecture by you when I was an early 20-something. Anyway, I did want to ask you when you would be on the east coast again in or around Pennsylvania, Upstate NY, or the Northern half of New Jersey. There are quite a few people I would love to bring to one of your lectures, and would love to see you again.